As mentioned, I enjoyed a lovely Q&A last month with Miranda July, the gal behind "Me and You and Everyone We Know" and "The Future." It was an unnaturally smooth interview, with each answer somehow leading into the next pre-planned question (was she reading my mind?). The finished piece is now online at SouthPhillyReview.com; however, it only includes about half of what was discussed. I'm totally screwing up the flow of converstion here, but below are some tidbits that didn't make the final cut, followed by a link the the article proper. R. Kurt Osenlund: You deal in themes of human connection, and you seem intent on stripping down this veneer of modernity to get at something more basic and simple. Is that something that you struggle with in your own life? 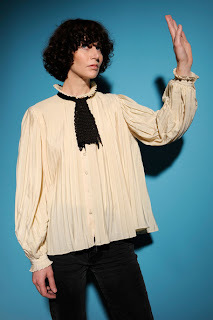 Miranda July: Well, I think the best thing that can come out of every single day of my life is a good idea. Connection, yes, but a lot of days I don't even really see anyone. Most of the hours are spent trying to figure out how to be totally free, and to feel something and have something come out of that. Modernity, like the internet and stuff, is usually in direct opposition to that free feeling – it dices up the day into these somewhat useless portions, where my mind is kind of shattered. But there's a whole lot of connection, too. I'm pretty diligent – I keep in touch with friends all over the place. MJ: Right. Well, I do. I like that in stories, too, but it works so well in a visual medium. I love these really potent objects, especially when you're dealing with these kinds of metaphysical, or spiritual, and, certainly, psychological, things that are like, “What are we even talking about here?” or, “What's real?” It's good to have these real objects that are so mundane they're kind of funny, and yet they're turning points. They matter, and they do matter in our real life. You know, we have all these objects and they're not to be overlooked. RKO: I just want to check and make sure the tape recorder's still running...important object, this. RKO: My partner works in assisted living, and he has a resident who, for years, has been making up dirty limericks with his wife, just like the older gentleman in "The Future." So I have to ask where that came from. MJ: Oh! That's all real – that's him! It must just be a thing that's from another era. But he's not an actor. He's playing himself. I met him, as Jason does, through the classifieds. I was doing another project where I was interviewing people selling things in the classifieds, so that's how I found him. He made nine cards a year for his wife, a lot of them really dirty. That part didn't exist in the movie until I found him. He's the only person who's improvising. So, yeah, that was all true. Sadly enough, right after I finished the movie – the day after – he died. RKO: Wow. How often do you encounter elements like that? And how often do you think you'll use them and then reject them? What's the cutting-room-floor-to-final-cut ratio in terms of the quirkier things? MJ: Well, the classifieds interviews I did, the whole story of that project is coming out in a book in the fall. It's called “It Chooses You.” I did that book partly because there were about 10 other people I met, and I wasn't looking to put them into the story, but they were just so interesting. There's a ton of stuff like that. Even this movie started out as a performance, but there are a lot of things in the performance that didn't make it into the movie – whole scenarios of what happens when time stops, some too complicated to shoot. And then there's stuff you just have to fit in. At one point, the cat was very controversial – everyone was like, “You gotta cut out the cat. How does that fit in? It's like a different movie or something.” So you have to know – you can't cut out everything. You have to stick by some things until they work. RKO: Clearly the cat in the new film represents change and the future for this couple in the way a child would, and it scares them. What else does the cat symbolize for you? MJ: Good question. Because it doesn't just symbolize a baby. I would think, “Does it work as a baby?” Then I'd also think, “Does it work as me with my parents? Like, where I'm the cat?” There's that feeling of sort of always waiting for you parents to really see who you are, which is never gonna happen, for me at least. They're great people, but I could wait forever, you know? So that feeling of waiting for them to come get you – it's a very young feeling, but I think you can stretch it into as much of your adult life as you want to. And then there's a point where you start to let go of that. It's kind of sad, almost like a death of some longing in realizing, “That's on me. No one's ever gonna come. Not even a great love is gonna fix that thing.” It's sort of just yourself – your loneliness that you're stuck with. So sometimes I would think of it that way. And other times I'd really just try to think of it as a cat. Read the rest at SouthPhillyReview.com! CLICK HERE.